Reduce the risk of washing induced marring with this mitt! The Gyeon Smoothie wash mitt is an extremely soft wash mitt, designed to help you safely clean the surface of your vehicle. The majority of imperfections we see in paint today come from improper washing and drying techniques and products. Even if you have the correct technique, choosing the wrong tools can leave you with ugly imperfections in the paint, requiring expensive polishing to remove. 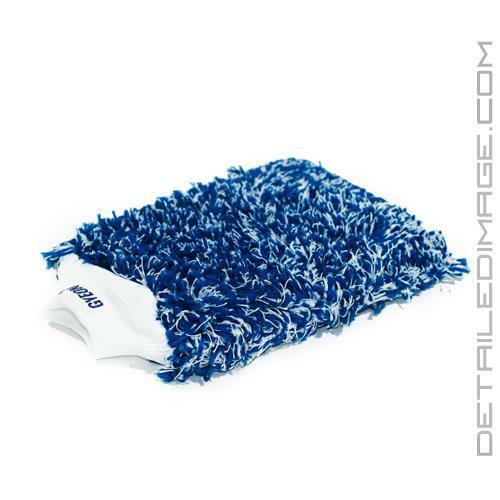 The Gyeon Smoothie wash mitt is composed of thousands of small and soft microfiber stands. Each one of these strands allows you to hold a great deal of soapy suds, which encapsulate dirt and grime and lubricate the surface. Once encapsulated, the strands in Smoothie will trap the dirt and grime, allowing you to remove contamination fast and easy. On the bottom of the mitt, the soft elastic cuff holds comfortably to your wrist, so you can wash without the mitt moving around. While extremely soft, this mitt is built to last and works great on lightly or heavily soiled vehicles. Gyeon recommends using this mitt with their Bathe shampoo, but it also works great with other quality shampoos as well. Stop risking adding imperfections into your paint with low quality wash mitts, grab the Gyeon Smoothie instead! Fully synthetic and heavily resistant wash mitt being equally safe as a natural wool mitt! GYEON Q2M Smoothie is a large step forward in automotive maintenance. It's the first fully synthetic and heavily resistant wash mitt, equally safe as a natural wool mitt. It's main features: safety, softness, ergonomy add extended durability due to innovational type of fibers. Q2M Smoothie glides over the surface collecting dirt particles in the safest possible way. The washing process feels more "lubricated" and smooth. The mitt is equipped with an ergonomic welt protecting it from slipping or falling. Very thick wash mitt, hold soap very well and helps really clean the flat surfaces of the vehicle. Not very flexible but works very well.